The ADIA have partnered with CSCS to give their members who have sat the BS EN16005, accredited by City & Guilds access to go on site. This means their members who sit the BS EN16005 AND the Health and Safety test, will not have to complete other courses to go on site. Below are details of the changes ADIA will be undergoing from 1st May 2017. Engineers can go on site. No additional courses need to be taken to gain CSCS card. 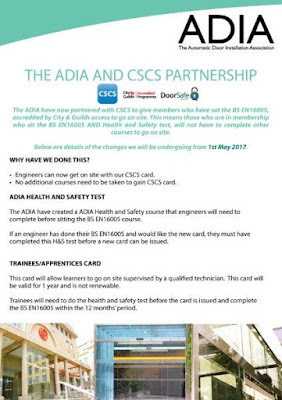 The ADIA have created an online ADIA Health and Safety course that engineers will need to complete before sitting the BS EN16005 course. If an engineer has done their BS EN16005 and would like the new card, they must have completed this H&S test before a new card can be issued. This card will allow learners to go on site supervised by a qualified technician. This card will be valid for 1 year and is not renewable. The accreditation lasts four years. After this, engineers will have to reapply to do a renewal exam and Health and Safety test. Engineers with a card still in date, are not required to order a new card. Would like the new CSCS card (health and safety test must be taken before issue). The ADIA hope you will welcome this development of the BS EN16005 and the opportunities it offers members. CSCS will be contacting thousands of businesses across the UK to let them know that BS EN16005 is now recognised. You can view the new Terms and Conditions by clicking here .